In the UPTET 2016 Examination, near about 7.60 Lakh candidates has tried their luck to get qualified for the Government Teacher JOB / Vacancy. Although, the passed UPTET candidate percentage is quiet low in the UPTET 2016 Examination, the number of UPTET applicants is expected to cross over 10 Lakh in the coming years. The main reason for this rise is due to the Hon’ble Supreme Court Judgement going against the Shiksha Mirta’s appointed as the assistant teachers in government schools / colleges. At present, the coming UPTET Examination is the only hope left for the Unemployed UPTET candidates. Today, we are here a previous year UPTET 2016 Solved question paper of the Junior / Primary Level (PRI-2016, class 1 to 5). Download UPTET 19 Dec 2016 Primary Level (Paper-1) Set-P Question Paper in English / Hindi / PDF Format with the Solutions / Answer keys. UPTET 2016 PRI Question Paper 1 (Class 1 to 5). 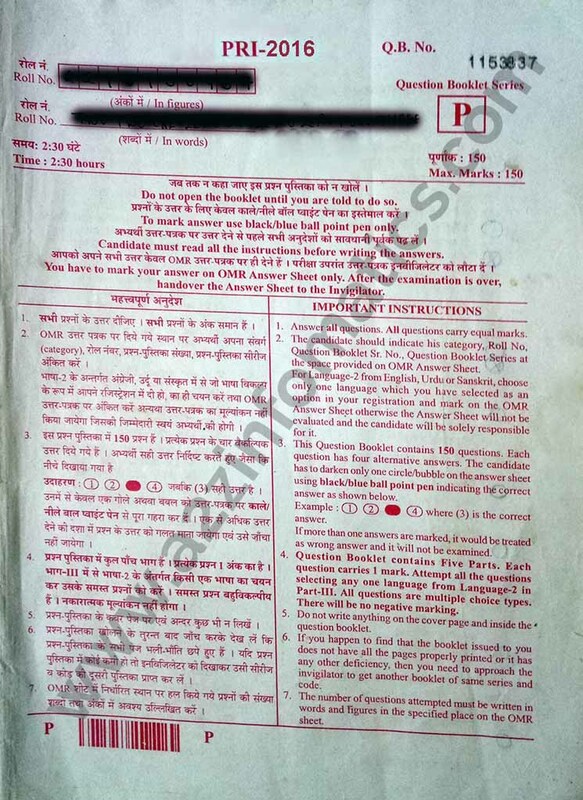 To help all the effected Shiksha Mirta’s & other UPTET applicants, today we are here with the UPTET 19 Dec 2016 Primary Level Question Paper SET-P (PRI-2016) with the official answer keys. UPTET Previous year solved papers are very helpful in the UPTET Examination prepararion and can prove the decisive factor to pass out UPTET 2017 Examination. You can use these solved previous year UPTET question papers as sample papers, model test papers and practice UPTET papers. If you are attempting UPTET 2017 for the first time, this original previous year UPTET question paper will give you a real feel about the UPTET Exam question pattern. In simple words, UPTET Study Material is incomplete without the inclusion of the these real UPTET question papers. Who will get benefited with Previous Year UPTET 19 Dec 2016 Question Papers with Answer Keys. Applicants / Candidates preparing for the UPTET Examination this year will get benefited the most. They can attempt this UPTET question paper as a practice UPTET exam prior to attempting the UPTET 2017 exam. Other than the UPTET candidates, these solved question answers maybe useful for the students preparing for the other competition exams. Organisations / Institutions assosiated with the UPTET Preparation Courses. General public can use these Previous Year UPTET Question Papers to increase their knowledgebase, who knows if they get any of these questions in the Kaun Banega Crorepati television show for the INR 1,00,00,000 reward. Download UPTET 19 December 2016 Solved Primary Level (PRI-2016, Paper-1) Question Paper with Anwer Keys / Solutions. UPTET 19 December 2016 Primary Level (Paper-1, PRI-2016) question papers consist of total 23 pages. The previous year UPTET 2016 primary level question paper has been divided into 5 sections which you can explore in the next section. Please don’t forget to read all the important instructions carefully prior to attempt for the UPTET 2017 Exam on 15 October 2017. Sections of UPTET 19 December 2016 Primary Level Examination (Paper-1, PRI-2016). Section 1: Child Psychology / बाल मनोविज्ञान. Section 2: Hindi (Language – 1) / हिन्दी (भाषा – 1). Section 3 (A): English (Language – 2) / अंग्रेजी (भाषा – 2). Section 3 (B): Urdu (Language – 2) / उर्दू (भाषा – 2). Section 3 (C): Sanskrit (Language – 2) / संस्कृत (भाषा – 2). Section 4: Mathematics / विज्ञान एवं गणित. Section 5: Environmental Education / पर्यावरर्णीय शिक्षा. Note: Hindi language-1 of Section-2 is mandatory to attempt whereas you only have to attempt 1 option language from the Section-3 A,B or C.
Download Previous Year UPTET 19 December 2016 Upper Primary Level SET-Y (Paper-2, UPRI-2016) Question Paper in PDF Format. In case, you need previous year UPTET 19 December 2016 Upper Primary Question Paper in PDF format, please check the link below to download the same. Download UPTET Dec 2016 Official Answer Keys for PRI-2016 & UPRI-2016 Levels (all Sets) (Announced on 28 December 2016 at Official UPTET Website). 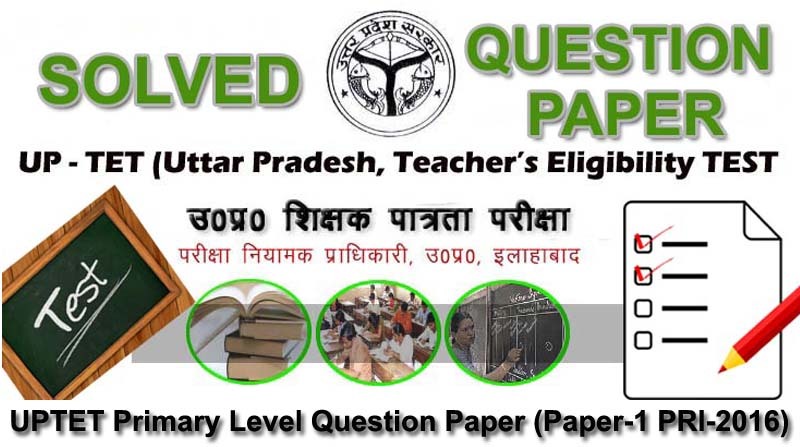 Download UPTET 2016 Primary Level Set P (Paper-1, PRI-2016) Solved Question Paper, Booklet Series P.
Important: The UPTET 2016 Official / Original Question Paper Set-P (PRI-2016) consist of 24 pages, link to all 24 pages is given at bottom of this post. You are now at page number 1 of UPTET 2016 Primary Level (PRI, Paper-1, Class 1 to 5) Solved Question Paper SET-P in Hindi / English, don’t forget to visit other pages (links given at bottom of this post) to download UPTET 2016 PRI Paper-1 in PDF format. The UPTET 2016 PRI (Paper-1, Class 1 to 5) exam was held on 19 December 2016 in the First Meeting (10:00 Am – 12:30 Pm). Note: Use Right Click (on PC) or Long Press (on Mobile / Tablet) > Save Image as > Save option to download UPTET 2016 Official / Original Primary Level Question Paper 1 (PRI, Class 1 to 5).